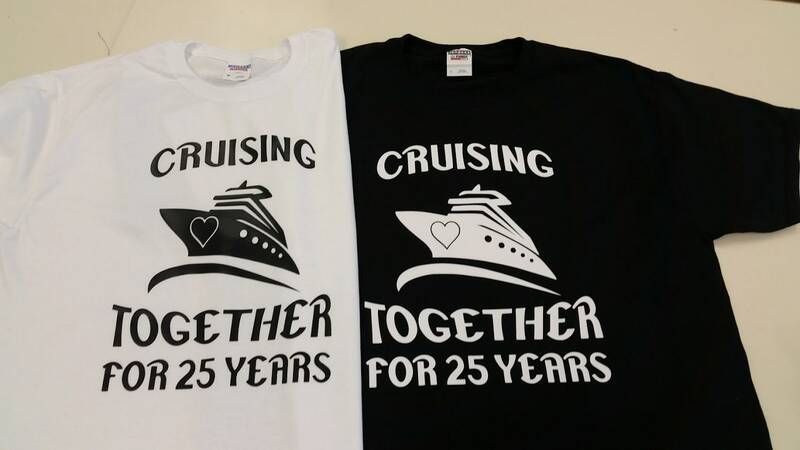 Are you going on a cruise for your anniversary? Check out this couples t-shirt design. Please notice that you will need to add 1 item per size in your cart. The cost starts at $15 each, depending on the size. I can customize it to whatever number of years that you have been together. Just put any additional information in the buyers note, upon purchase. These t-shirts are 100% Heavy cotton and are made with heat transfer vinyl. The tee shirts are sold in unisex/men's size from small- 4X. They ship first class unless you request a shipping upgrade. We loved the shirts, I surprised my husband and he loved it, Thank You! Good quality. We loved the shirts, Thank You!!! Good Quality.